PINK KUSH™: This stunning and highly regarded relative of OG Kush visually defies reality with her breathtaking pink and purple hues. Her flowers are dense and shimmer in the light with glistening trichomes in less than 70 days. Produces dense buds, so low humidity preferable. Many find this vanilla scented jewel the perfect antidote to serious sleep issues as it is extremely effective for both pain and insomnia. The OG in her means you can expect heavyweight effects in addition to a much-loved light feeling that provides guaranteed sensual satisfaction. 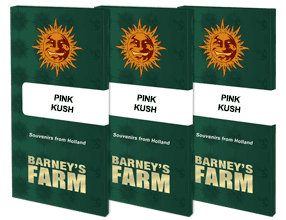 Rich in terpenes, Pink Kush tantalizes the nostrils and clears the senses. Flowering indoors is normally complete in 9 weeks, outdoors a dry climate is preferred. High yields can be expected 600-700 gr/m2, even though height is a modest 1.2m.